Drew this during the end of my C programming final exam. If you know me in real life, you’ll know that I’m all about smart cards, little pieces of plastic with a processor inside of them. 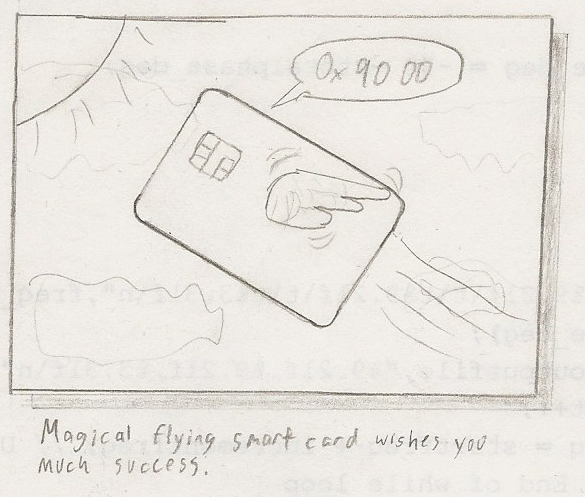 Also, 0x90 00 merely means “success” in smart-card language, hence the little tagline under the drawing. This entry was posted in Rambles, Uncategorized and tagged better than nyan cat, magical flying smart card, sketchm drawing, smart card by ginbot86. Bookmark the permalink.